THE SUB® is the innovative home tap from HEINEKEN® and Krups, designed by the highly acclaimed industrial designer Marc Newson. Select your favourite beers from around the globe, place the TORP in THE SUB, and enjoy delicious, freshly tapped draught beer. You can buy THE SUB®in THE SUB section of our website. THE SUB® has an energy label of "A+". This means this is one of the most efficient appliances within the home draught system category. THE SUB® uses an average of 10 Watts in a “steady state.” This means the home temperature is 20-22°C, the TORP® is pre-chilled to 2°C, and THE SUB® is not pouring. It is comparable to an unopened refrigerator. 10 Watts is the same as a usage of 0,010 kWh per hour. THE SUB® Compact uses an average of 11 Watts in a “steady state”. On an annual basis, when THE SUB® is switched on all year, the energy consumption in the "steady state" is approximately 87.6 kWh. THE SUB Compact® and its drip tray are made of plastic. 1.11 How do I load a TORP® into THE SUB®? 1.12 How do I know when my beer is ready to pour? 1.14 THE SUB® makes a noise while cooling the TORP® - is this a problem? 1.15 THE SUB® makes a noise when I pour – is this a problem? It can be that the TORP® was not inserted correctly and has not correctly activated the pressurizing mechanism. Please remove the TORP® and try inserting it again. Our Craft TORPS® are a few millimetres smaller than our regular TORPS®, which is why we include a plastic clip with them. Please make sure that you have placed the clip on the TORP® – simply insert the tube into your TORP®, then slide the clip over the top of the neck of the TORP®. This will help the TORP® fully activate the pressurizing mechanism. You can also remove this clip once you have finished the TORP® and re-use it on your next TORP® if needed. 1.22 The light on my SUB ® is not turning green. Once in THE SUB®, cooling down a TORP® takes 10 to 16 hours (depending on starting temperature of the TORP®). When your beer is chilled to the right temperature, then the light on the front of THE SUB® will turn green. To speed up the process, ensure your TORP® is fully chilled before inserting it into the SUB®. Set your fridge at the lowest temperature and store the TORP® on the lowest shelf (this is the coldest area) for 6 to 10 hours, or until the cold indicator on the TORP® turns blue. 1.23 I would like to order 10+ SUBS® for my business. 1.24 I lost my SUB® user manual. Where can I find it? Aside from seasonal beers, we regularly replenish our products, please subscribe to the email notification to receive an alert as soon as the product is available in our webshop again. This can be found at the bottom of the page of our website. No. The TORP® should not go below zero degrees as this may damage the packaging and cause beer leakage. You will no longer be able to use the TORP® once frozen. The TORP®S are sturdy, but they could leak if they freeze or are punctured. If you have a TORP® that was leaking when you received it, please contact our Customer Care team. It is no longer possible to register TORPS®. We apologize that the information on the quick guide that accompanies THE SUB® is not yet updated. We’re looking into an updated way to reward our loyal customers and plan to have a new rewards program in place as soon as possible. In the meantime, we encourage you to sign up for our newsletter and social media channels to receive special offers, updates on new products, opportunities to receive free samples and more. You can find it at the bottom of the page of our website. 2.21 Can I recycle the TORPS ? DE: Yes, TORPS can be deposited in the relevant machines to be channelled in the recycling stream. We advise you to cut the tubes prior to prevent jamming the machine. AT: The TORP® is made of PET plastic, and the recommendation is to dispose of the TORP® in an appropriate plastic waste stream. Actual realisation depends on local collection systems and policies in place. 3.2 Does a Craft TORP® expire? We guarantee good beer quality of fully sealed Craft TORPS® for 2 months after purchasing from our website. Once you’ve opened your TORP®, the beer is guaranteed to stay fresh for 15 days, if stored in a running SUB®. You can find the best-by date on the side of your TORP®. We guarantee the quality of the beer through the end of the month noted. After this date, quality may decrease. In general, we recommend storing your Craft TORP® in the fridge. That will ensure the best beer taste and experience. 3.5 What is the clip on my Craft TORP® for? 4.1 What is a draught keg? A draught keg is a 5L beer keg that can be used without any device. Kegs are pressurized and include their own tap system. 4.2 What is the weight of a full keg? The weight of a 5L draught keg is about 6 kg. 4.3 How many glasses of beer can be served from one draught keg? A 5L draught keg corresponds to twenty 25cl glasses. 4.4 Can the keg be transported? Yes, over reasonable distances and as long as the transport does not incur high variations in altitude and therefore too much pressure. Nevertheless, once at your destination, it is better to let it rest a few minutes before use. As the beer may have been shaken about, you must let the foam settle back down. Please note, the keg is not transportable by plane, because of the significant variation in altitude and therefore pressure. 4.5 The keg fell but it does not look damaged and/or the handles are broken. You can, in principle, still use this keg. It is better, once the keg has been straightened back up, to let it rest for about ten minutes before use. If the handles are broken, this is not a problem since you will not have to move the keg anymore. 4.6 The keg fell, there is a leak. If you notice a leak, the keg is no longer usable. If you have a draught keg that was leaking when you received it, please contact our Customer Care team. 4.7 I cannot find the use-by date. The use-by date is printed on the side of the keg, towards the bottom, or underneath. If the date is not on the keg, contact Customer Service and be sure to keep the defective keg. 4.8 How long can I keep a 5L keg? You can keep it until the end of the month indicated as the use-by date on the side of the keg. 4.9 How long can I keep a 5L keg once open? The pierced keg can be stored for 30 days if stored at a temperature between 5 and 8 degrees. The quality of the beer may be impacted over a period of time, which will impact the taste and the amount of oxygen in the beer. 4.10 At what temperature should 5L kegs be stored? The ideal storage temperature is between 5 and 8 degrees. Like all other beer kegs, do not allow the kegs to be exposed to temperatures exceeding 30 degrees. 4.11 Can I cool my keg faster by placing it in the freezer? No, beer is not a product made to withstand temperatures below 0 degrees. DO NOT FREEZE the keg as it may explode if frozen. 4.12 What should I do with empty kegs? Are they recyclable? Empty kegs can be thrown away with other household rubbish. However, be sure to respect the sorting criteria specific to your local authority. 4.13 I bought a 5L keg but I do not have a compatible machine. You can use the keg by itself by using the mini-spout and the mini pull handle that are in the plastic shell at the top of the keg. 4.14 What is the cooling time of a 5L keg? The cooling time is about 12 hours in your refrigerator. This time depends on the performance of your refrigerator, its size and the ambient temperature. 4.15 What is the best way to cool a keg to the right temperature? The best way to cool the keg is in your refrigerator. To speed up the process, set your fridge at the lowest temperature and store the TORP® on the lowest shelf (this is the coldest area). Blade® is an 8-liter countertop draught dispenser that provides a freshly tapped beer. 5.2 What are the dimensions of Blade®? Blade® is 59 x 29 x 47.1 cm (h x w x d) including drip tray, and weighs 17.6 kg (26 kg including a keg). 5.3 Is Blade® battery-powered or do you plug it in? Blade® is not battery powered. Blade must be plugged into the wall mains with a 2 meter power cable. 5.4 Should I leave the appliance plugged in? When a keg is loaded in Blade®, it should stay plugged in in order to keep the keg perfectly chilled and ready for use. We recommend unplugging the appliance when it does not have a keg installed. 5.5 How energy efficient is Blade®? The energy consumption will be approximate 0.8 kWh per day. This is comparable to a 35 Watt lamp. 5.6 How do I load a keg into Blade®? 5.7 How do I clean my Blade® appliance? Unplug Blade® before cleaning the inside and outside with a soft cloth. Use a damp cloth to clean the cover and a dry cloth to clean the cooling chamber. Blade® should never be immersed in water. Harsh cleaning products may damage the appliance. Clean the drip tray with warm, soapy water after every use. We recommend cleaning the tap every time you load a new keg to avoid contamination and mixing different kegs. 5.8 Is it possible to regulate the temperature of Blade®? The Blade® appliance chills to 2°C and cannot be set to any other temperature. 5.9 How do I know when my keg is cold enough? 5.10 My Blade® appliance makes a noise while cooling the keg - is this a problem? 5.11 My appliance makes noise when I pour. Is this a problem? No, this is perfectly normal. You will hear the air pump inside the appliance during pouring. After closing the tap, the pump will be in operation until the controlled pressure is reached. This can take a few seconds. 5.12 I lost my Blade® user manual. Where can I find it? The Blade® user manual is delivered with the appliance. You can also download it here. 6.1 What is a Blade® keg? 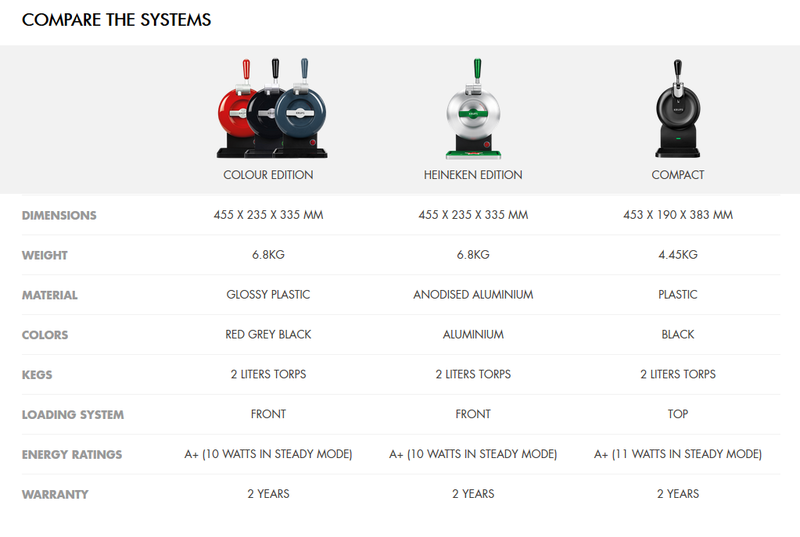 A Blade® keg is an 8L beer keg, and is specially made for and can only be used with the Blade® countertop draught system. 6.2 How much volume of liquid does a Blade® keg hold? A Blade® keg holds eight litres. 6.3 What brands are available? The full range of brands available in this country is listed on our website. The selection we offer may vary depending on the country, and we’ll be introducing new brands over time. 6.4 What are the dimensions of a keg? Each keg measures 20.5 x 36.91 cm, and weighs 8.3 kg. The kegs are delivered in individual boxes. The box dimensions are: 20.9 x 21.5 x 38.15 cm. 6.5 What is the shelf life of a keg? The shelf life of a keg is 6 months. Once the keg is installed in Blade®, it will stay fresh for up to 30 days. 6.6 How should I store kegs? Store the keg on a cool place and pre-cool the kegs in the fridge at least 24 hours prior to use. The keg should ideally be chilled to to 4⁰C. 6.7 Can I put kegs in my freezer? No. The keg should not go below zero degrees as this may damage the packaging and cause beer leakage. You will no longer be able to use the keg once frozen. DO NOT FREEZE the keg as it may explode if frozen. 6.8 How long does it take to chill a keg? 6.9 Can I take out a keg before it is empty? Once a keg is open, you have to keep it in your Blade® appliance. You can store the open keg for up to 30 days. This will keep the keg at the right pressure and freshness. You can take the keg out before it is empty, but once removed it should not be consumed. 6.10 Can I open a keg and serve it like a can or glass bottle? No, the keg is specifically designed to be used with Blade®. The beer or cider inside the keg needs to be kept under controlled pressure, otherwise it will not be the quality you would expect. 6.11 Can I use kegs with other home draught appliances? No, the 8-liter keg is designed specifically for the Blade® appliance. 6.12 What should I do if my keg leaks? The kegs are sturdy, but they could leak if they freeze or they are punctured. If your keg is leaking upon arrival, please contact Customer Care team. 7.1 What is THE SUB® referral program? It is a program that we provide to facilitate our existing customers to introduce a friend to the SUB® products on our Website. If you like us enough to recommend us, we will happily give your friends an introductory discount, and we will give you a discount as thank you. 7.2 What is Mention Me? Mention Me is the company who manages our referral program. 7.3 How can I refer my friend? Once your order has been processed, a pop-up will appear enabling you to refer a friend with a link. After clicking through the call to action button on the first step of the pop-up, you will receive the referrer registration and forwarded e-mails from Mention Me. You can inform your friend by either sharing the link via email or private message from social media platforms (WhatsApp, Facebook, etc. ), or by informing the friend to fill in your full registered name during the checkout process when purchasing. If you share the offer via email or private message from social media with a friend, you can review the content of the proposed e-mail prior to sending the message. 7.4 I would like to refer a friend but did not receive a pop-up with a link. If you have a pop-up blocker or have left the page too fast, you may not receive a pop-up with the link. If this is the case, please contact our Customer Care team and provide your order number. 7.5 I would like to refer a friend. Is there a limit to how many friends I can refer? There is a limit of 5 referrals per day and a maximum of 25 referrals per year. 7.6 How many times can the link be used? Each friend can only use the link once. 7.7 I referred a friend. What reward will I receive? You (the referrer) will be rewarded with a separate discount code that will be sent via e-mail once your friend has placed a qualifying order. The program offers you a 15% discount code including already discounted SUBS® however, it cannot be used in conjunction with discounted beers or accessories. 7.8 How will I know if my friend has placed an order, and if I qualified for a reward? You will receive an e-mail as soon as you have qualified for a reward. The e-mail will come from refer-a-friend@mention-me.com. You can also see the status of your referrals on your dashboard. You can find a link to your sharing dashboard at the bottom of the e-mail you receive when you sign up for our referral program. 7.9 I was referred by a friend. Where should I enter their registered name? During the checkout process, there is a link just above the voucher code box that says “Been referred by a friend?” Once you have confirmed the friend who has referred you, you will be able to access your reward. You can then enter the code, in the ‘DISCOUNT CODE’ field during checkout. 7.10 I was referred by a friend. What is the discount I will receive? You (the referee) will receive a 15% discount off THE SUB® home draught appliances in your first order. The code does not entitle you to 15% off beers or accessories and is valid only on THE SUB® home draught appliances. The code can only be used once and by you only. 7.11 Can I use the offer with other discounts or vouchers? The code cannot be used in conjunction with any other offer or discounted products except on discounts off THE SUB® home draught appliances. The code cannot be transferred, exchanged for cash or sold. 7.12 Where should I enter the code? In order to use the offer, the code should be entered in the ‘DISCOUNT CODE’ field at the checkout. 7.13 How long is the code valid? If you have been referred by a friend, the code received is valid for 14 days. If you have received a code as reward for referring a friend, the code received is valid for 6 months. 8.1 What is the best way to care for my beer glasses? 9.1 What are the advantages of an account? 9.2 Do I have to create an account to place an order? Creating an account is useful but it is also possible to order withtout an account. If you do not tick the box "Create an account for your next visit", you will order as a guest. 9.3 How can I create an account? 3) tick the box: "Create an account for your next visit"
9.4 How can I update my personal information? 9.5 I can't sign in to my account. How can I reset my password? Reset your password by clicking on ‘forgot my password’ on the login page. 9.6 I lost my account login information (username & password). 9.7 How can I remove myself from your email list? Edit your communication preferences under the ‘Newsletters’ section of Your Account, or contact our Customer Care team. 10.1 What payment options do I have? 10.2 Is there a minimum order value? What if I am using a discount code? The minimum order value on the-sub.com is €15. If you are using a discount code for your order, the total must still be at least €15 after the discount is applied. 10.3 Can I save my payment details for next time? 10.4 Where are my payment details stored? 10.5 Can you guarantee that my payments will be secure? 10.6 When trying to place an order, I receive a notification that payment is not possible. 10.7 Who can I contact if the price on my invoice does not match my order total? 10.8 I have a voucher, but it is not working. 10.9 Where can I find my invoice? 11.1 What delivery options are available? The delivery options, shipping times and costs offered during checkout may differ based on your specific shipping address and the items selected. Please note that the minimum order value for the-sub.com is €15. Standard delivery through UPS within 3-5 working days when ordered before 4pm. Delivery of the products will only take place within Germany and Austria. Unfortunately we are unable to deliver to Heligoland and Büsingen and therefore unable to deliver to the following postcodes: 88266, and 27483 to 27498. 11.2 How much does delivery cost? 11.3 How can I track my order? You will receive a shipment confirmation via email with a link to track your order. You can also track your shipment via your order number on the UPS tracking site, using your order number as the reference. 11.4 Who should I contact if there's an issue with my delivery? 11.5 I only received part of my order, what should I do? You can also track your shipment via your order number on the UPS tracking site, using your order number (SUBUK-ORD######) as the reference. 11.6 Can I have my order delivered to a different address than my billing address? Yes - you can have your order delivered wherever you like within Germany/Austria. You can save multiple addresses in your profile for easy access in future. 11.7 Can I have deliveries shipped internationally? 11.8 Can I cancel my order? 11.9 Can I make changes to my order? In case you would like to change your delivery address, this is only possible via UPS My Choice. 11.10 What happens if I am not at home when the order is delivered? 11.11 How can I return the products? 2) Fill out the Cancellation Form and send it to our Customer Care team by e-mail at kontakt@the-sub.de. 11.12 When I accept my delivery, do I need to prove that I am at least 18 years old? 11.13 My order is a gift. Is the packaging discreet? 11.14 My order shows as “delivered” but I have not received it. It is possible that your order has been shipped in more than one parcel. It can happen that UPS delivers different parcels on different days, even if they belong to the same order number. If UPS is unable to deliver to you, it may be that they have delivered your parcel to a UPS Acess Point where you can pick it up. In that case, you can find the location of the UPS Access Point in the tracking link. For a detailed overview of the shipment of your parcel, please click the “View Details” option under the status of your parcel on the UPS tracking site. You can also choose “detailed view” within the “Shipment Progress” box for a more in-depth explanation of where your parcel has been. If you have checked these options and are still unable to determine where your order is, please contact our Customer Care team. 12.1 What is your warranty policy? 12.2 I would like to claim my warranty. Krups grants a two year warranty on THE SUB®, starting from delivery date. Claim of warranty may lead to repair or replacement. You may return your unused SUB® within 30 days for a full refund (see article 11.10). 13.1 How can I contact the Customer Care team? If you have any questions or comments, please contact our customer service department. We are available on working days from 10am to 5pm at kontakt@the-sub.de or by phone at 08006279960 (Germany), or 0800401038 (Austria). Please note we are closed on Dutch holidays. 13.2 I have a complaint, who can I contact? If you are experiencing issues with our products and/or services , please contact our Customer Care team.